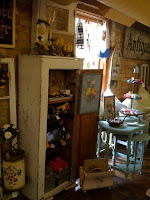 My darling friend Lori has the most amazing booth called "SWEET BASIL" at Heritage Trail Mall on Ridge Road in Wilmette. She has an incredible knack of spotting the most adorable "shabby Chic" objects. She recently found for me a beautiful blue bench to go in my new mud room. It is upholstered in silver cow hide with rusty nail heads. One problem. Its too pretty to sit on!! !